This original Spanish home at 1903 Prosser Ave., LA CA 90025 lasted a brief 11 days on the market before receiving an accepted offer on 5/20/11. The home was listed on 5/9/11 for $869,000. Previously, the home spent some time on the market in 2008/2009, starting as high as $1,275,000 and reduced down to $899,000. 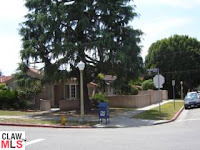 1903 Prosser Ave closed on 6/17/11 for $869,000 or $700.81 $/sf. According to the MLS, the home is a 3 bedroom / 1 bath, 1,240 sq ft home on a 7,425 sq ft lot. The home is mostly in its original condition and is ready for your remodeling, expansion or rebuild.